Zebrafish have emerged as a powerful model organism to study embryo morphogenesis. Due to their optical clarity, they are uniquely suited for time-lapse imaging studies, providing insights into the dynamic processes underlying tissue formation and cell migration. These studies have been tremendously facilitated by the availability of transgenic zebrafish lines, labelling distinct embryonic structures, individual cells, or even subcellular structures, such as the nucleus. Zebrafish studies have revealed that the migration of several different cell types in the embryo is controlled by chemokines, small vertebrate-specific proteins. Here, we report methods to analyze the expression pattern of a given chemokine and its receptor in transgenic zebrafish using fluorescent in situ hybridization in combination with an anti-green fluorescent protein (GFP) antibody staining. We furthermore illustrate how to image migrating cell populations using time-lapse microscopy in double-transgenic embryos. We show how to investigate cell number and direction of migration by using a nuclear-localized GFP. The combination of this transgene with a membrane-targeted red fluorescent protein allows for the simultaneous determination of changes in cell shape, such as the formation of filopodial extensions. We exemplify this by describing how a mutation in the chemokine receptor cxcr4a affects endothelial cell migration and blood vessel formation. 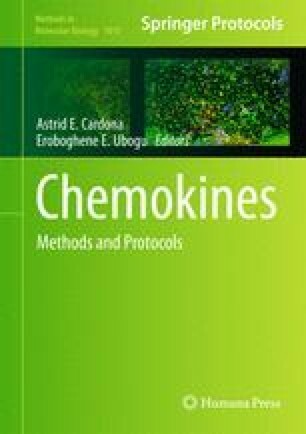 Finally, we provide a method to perform fluorescent angiography to monitor blood vessel perfusion in chemokine receptor mutants. We would like to thank Wade William Sugden for critically reading the manuscript. This work was funded by the Max Planck Society, a Deutsche Forschungsgemeinschaft (DFG) grant (SI-1374/3-1), and an ERC starting grant (260794-zebrafishAngio) to AFS.